Discover a different side of Greece with these 8 driving routes (maps included) that will take you to mountain villages, lakes, national parks and more. The summer may be many months away, the islands dormant and isolated, serviced by only a few boats a week. But that doesn’t mean that one needs stay in the city. For anyone with a sense of wanderlust the open road beckons. 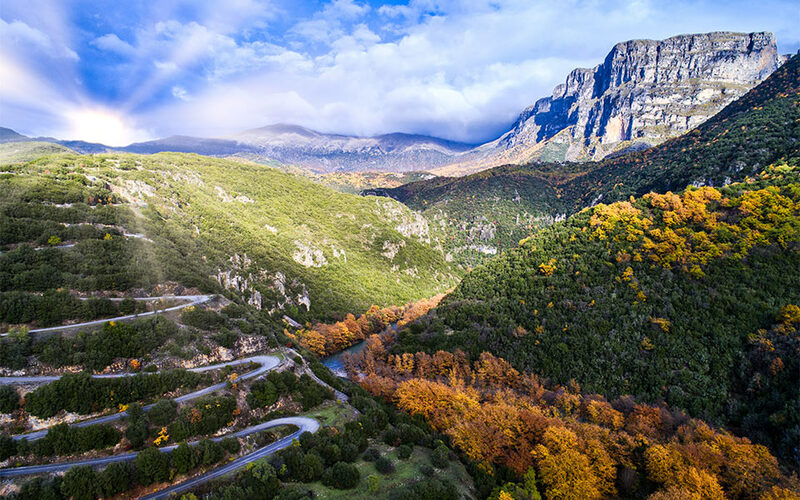 Following the recent completion of major motorway upgrades, discovering the wonders of mainland Greece by car has never been easier: snow-capped mountains, rivers, forests, lakes, ancient sites and welcoming villages. Any great road trip is as much about the enjoyment of the drive as it is about combining incredible stops. We have mapped out (literally) 8 superb routes that will have you enjoying every bend, stunning view and picturesque village. Find your favourite and follow the link for the full route. These two villages are less than an hour’s drive away from each other but couldn’t be more different, and this route is the ultimate in combing mountain and sea. 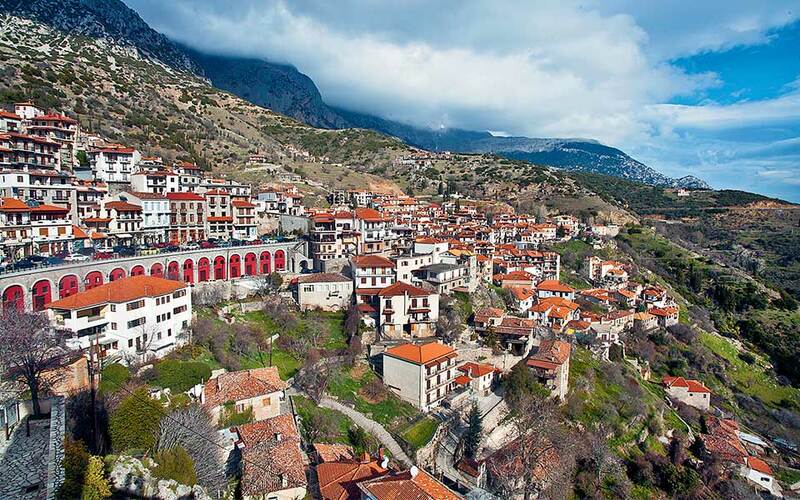 Arachova is one of Greece’s most famous and well-developed mountain villages, catering to the skiers who take to the slopes of Mount Parnassos. Seaside Galaxidi, on the other hand, was once a key port and shipbuilding center in the pre-industrial age, as evidenced by the elegant neoclassical homes built by wealthy sea captains. Driving from one to the other will also take you past the archaeological site of Delphi – at its best in the off-season – as well as through charming villages with glorious views over an endless ancient olive grove with the Corinthian Gulf glimmering in the distance. To see the full route and map click here. 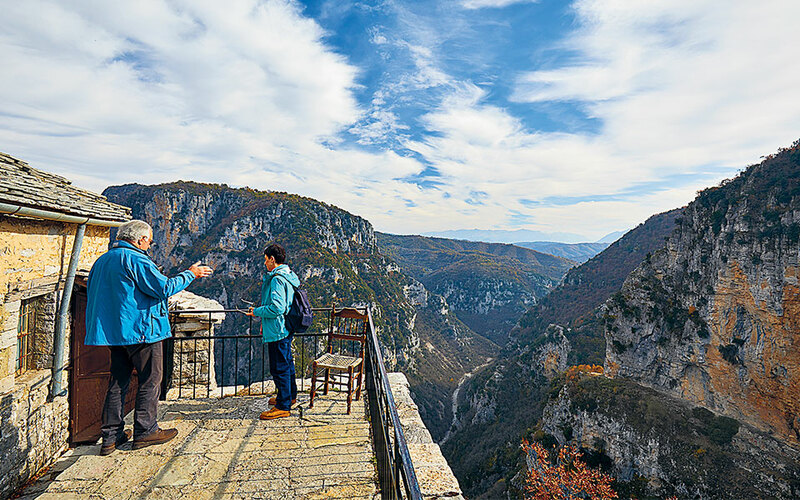 If long, straight stretches of road are your thing, you might want to give this one a miss; in the region of Zagori in Epirus, the mountains are tall and the bends are many. But these are a small price to pay for the sheer beauty you will encounter at every turn: dense forests of fir and pine, towering peaks, pristine rivers, and deep gorges teeming with life. Our suggested routes will take you to some of the most important of the 60-odd stone-built villages in the region – all testaments to the skill of the craftsmen of old – as well as to some of the region’s (many) natural wonders. A large manmade lake in Central Greece created in the 1950s when the Tavropos River was dammed in order to irrigate the plain of Thessaly, Lake Plastiras has developed over the years into a popular ecotourism destination thanks to the great beauty of the lake itself, and the mountains that surround it. Circumnavigating the lake is a particularly good road trip to take with kids, as the drive is relatively easy and there are a number of stops for fun activities, such as boating on the lake or horseback riding and archery. At times the road runs by the water’s edge, and at others it climbs into the hills, affording stunning views over the water. At the many villages you’ll pass, there are great options for local cuisine and for accommodation, including eco-tourism and agrotourism guest lodges. Lake Doxa may be man-made and not even 20 years old, but it looks as though it’s been there forever. 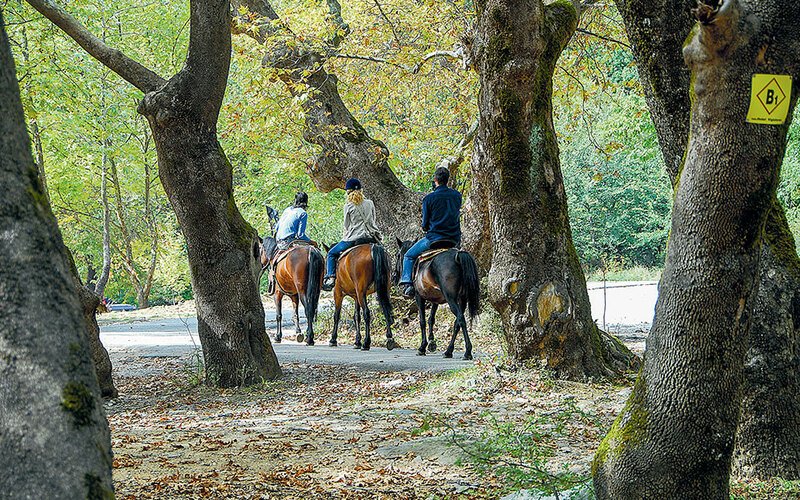 A mere two hours drive from Athens will take you to the village of Trikala in the region of Corinthia in the northern Peloponnese, a great starting point to explore the surrounding countryside. 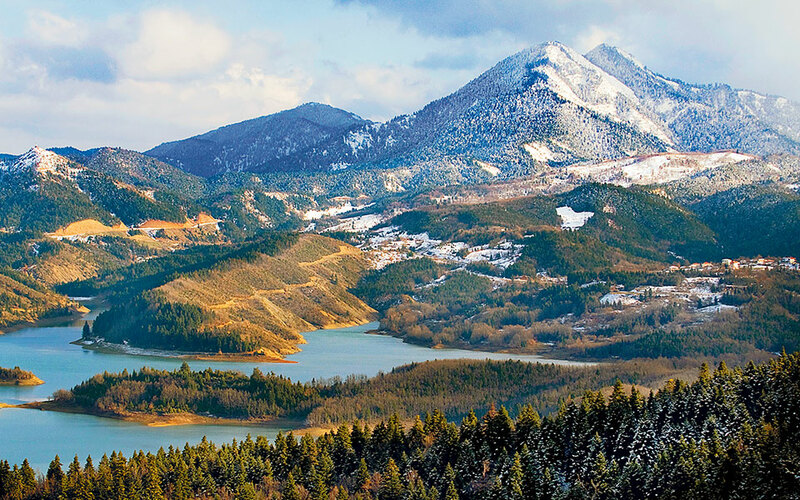 Together with the requisite charming villages dotting slopes covered in forests of fir and black pine, this mountainous region also features a number of small lakes and wetlands perfect for nature-loving strolls any time of the year. Thanks to its proximity to the capital, the area has well-developed tourism infrastructure offering plenty of options for accommodation and great meals. Our suggested route ends at Stymphalia Lake – an important wetland that also features a modern nature museum complete with lookout points to spot the many birds that live in and visit the lake. If traveling in the winter note that this mountainous area routinely gets snowfall at higher elevations. 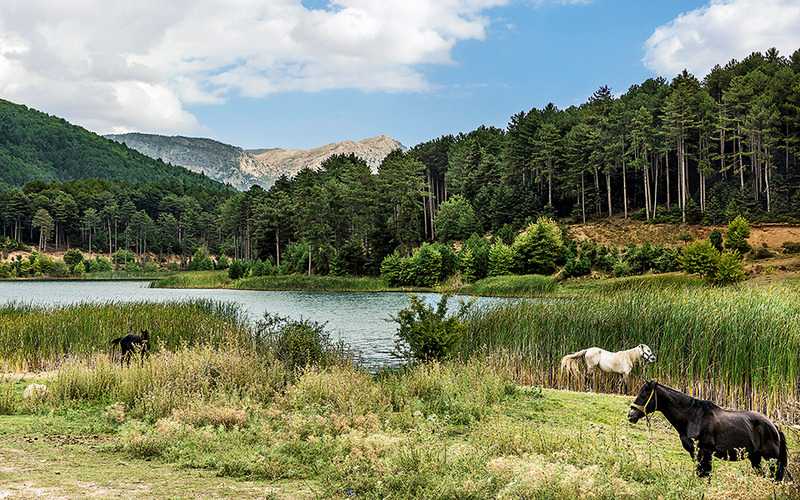 Driving from Kilkis to Agkistro along Greece’s northern border will take you to not one but two of Greece’s most important lakes: Lake Doirani and Lake Kerkini. Both gorgeous, the latter also affords the opportunity to break up your driving by hiring a boat to explore this manmade body of water that was first created in the 1930s and which has now become a key wetland that supports thousands of birds including pelicans and flamingos. 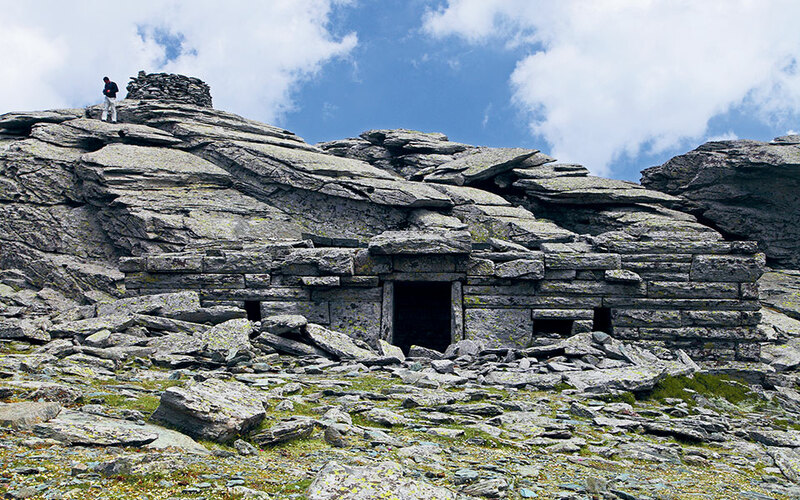 This route will also take you through a protected oak forest with centuries-old trees and to mountain villages nestled in the slopes of glorious Mount Beles. At the end of your journey you can relax in a Byzantine hammam in the village of Agkistro. This route is particularly good if your starting point is Thessaloniki. While this route’s starting point of Karysto is a popular summer destination that is only 3 hours from Athens, as you set off along this route you will soon feel that you are leaving civilization behind for a more primal landscape. The southeastern edge of Evia is one that is wild and rugged – a place where rocky slopes descend into seas whipped up by the perpetual winds. Outside of the summer, most of the villages here are almost entirely deserted and the options for food and accommodation are few and far between. Instead, the reward here is experiencing a land that is isolated, elemental and mysterious. Hike up to the ‘dragon house’ on Mount Ochi, or meet the locals in Andia – a village with its own language made up entirely of whistles. When you finally arrive on Evia’s legendary cape and gaze out at the churning sea (where many a ship has foundered) you will feel as if you have come to the edge of the world. 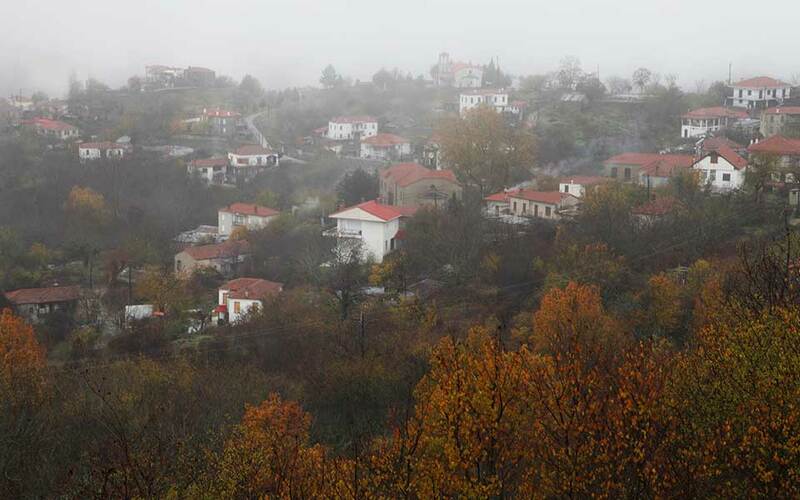 In the small town of Siatitsa in northwestern Greece, once prosperous fur traders have left their mark in the form of elegant neoclassical homes. This charming town is the starting point for this route which takes you into the Mastorohoria – a group of mountain villages that gets their collective name from the master builders that hailed from here and who were once famed throughout the Ottoman Empire. Their legacy are the gorgeous homes, churches and other buildings that comprise these villages, built from stone with unparalleled skill. In a mountainous areas full of forests, you will also see numerous stone bridges spanning streams and rivers as if out of a fairytale. When hunger strikes, stop in a warm traditional kafeneio and enjoy a glass or two of fiery tsipouro with local delicacies. 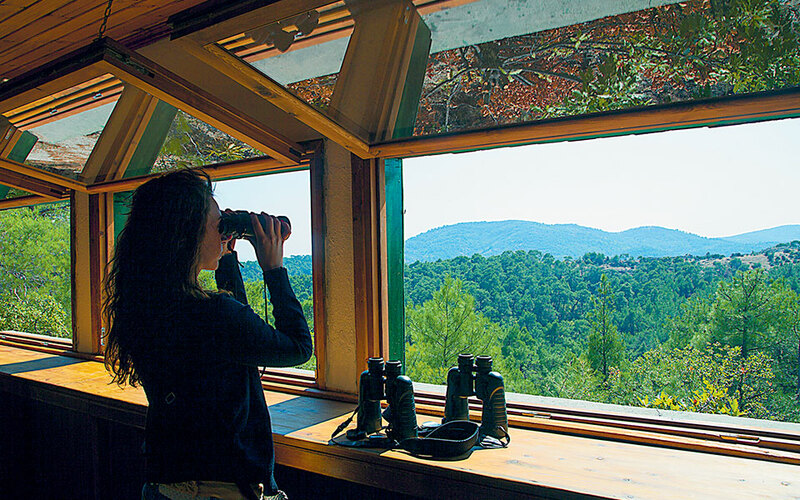 In the northeastern corner of Greece, near the border with Turkey are two key ecosystems that are must-visits for bird and nature lovers. This route begins in the Evros Delta, where the river meets the Aegean and forms an extensive wetland that is rich in birdlife. After visiting the nature reserve either on foot or by car, you will head north towards the Dadia National Park – another diverse ecosystem that is home to many species of plants and animals, including endangered vultures. The nearby village of the same name features charming guesthouses and tavernas. The route then takes you to Soufli, a small border town where the Silk Museum will reveal how this town was once a major silk-producing center, and where you can enjoy meals with strong Asia Minor influences.